Lucky Savings is a program officially published by Illustrious Apps. Our malware analysts have found that while this advertisement-supported program is not the most dangerous threat, it certainly does deserve removal. If you do not feel the need to delete this program even though you realize that it is not beneficial, there are a few other reasons why you should remove Lucky Savings from your operating system. This report discusses these reasons. Many computer users download Lucky Savings from lucky-savings.com, but many users also acquire this ad-supported program bundled with malware. Third-party installers could be used to distribute this unreliable application, and this can be very dangerous. The infections installed along with Lucky Savings can be much more dangerous, which means that their removal might be much more important. Even though you should delete Lucky Savings right away, all unreliable programs require the same attention. If you have installed Lucky Savings onto your computer, you must think that it will provide you with shopping deals. Even though this adware can showcase pop-up and banner offers, not all of them should be trusted. After all, this ad-supported program is not just an advertising tool. Our research has revealed that Lucky Savings can install a fake "browsing guard program" and unreliable browser extensions. Unfortunately, not all computer users know that they need to remove Lucky Savings-related software. The extensions associated with Lucky Savings can be installed onto Internet Explorer, Firefox, and Chrome browsers without your permission. This is very malicious, which is why you should delete Lucky Savings-related add-ons without any hesitation. Even if these add-ons appear to be useful, removing them is the way to go. Note that Lucky Savings has a few clones, including Coupon Chaser, Excellent Coupons, and Browse Guardian, that can also install software without your permission. Lucky Savings spies on you, exposes you to unreliable advertisements, and installs unauthorized computer programs. Due to this, we identify this adware as a security threat that requires immediate removal. The instructions below show how to delete Lucky Savings from your operating system and how to delete the browser extensions that might have been installed along with it. The manual removal option is not the only one, and users often choose to remove Lucky Savings using automated malware removal software. This is the option that our malware researchers suggest as well, because only this software can guarantee the removal of all existing computer infections and the protection of your Windows operating system. Click the Start button on the Taskbar. Select Control Panel and move to Add or Remove Programs. Click the Windows icon on the Taskbar and select Control Panel. 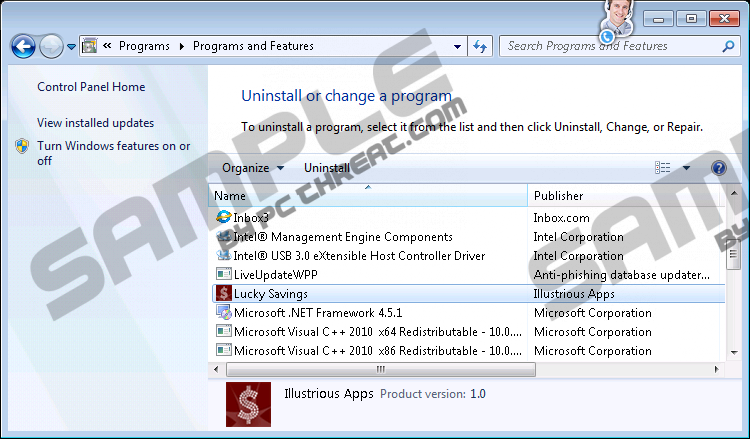 Go to Uninstall a program and right-click the undesirable program. Click Uninstall to delete Lucky Savings. Enter Control Panel, click OK, and move to Uninstall a program. Open the browser, tap Alt+T, and select Manage Add-ons. Go to Toolbars and Extensions and Disable the undesirable extensions. Click Close. Open the browser, tap Ctrl+Shift+A, and select Extensions. Identify the undesirable browser extension and click the Remove button next to it. Open the browser, tap Alt+F, move to More tools, and click Extensions. Find the undesirable extension, click the trash icon, and click Remove. Quick & tested solution for Lucky Savings removal.